We all fail—some of us more than others. So why not get some funny people together to talk about it? The show will feature the guests talking about their notable and most hilarious failures and a bunch of games, some of which may include drinking. If you’ve ever failed at anything, this is the show for you. And if you’ve never failed, we don’t want you there, you weirdo. 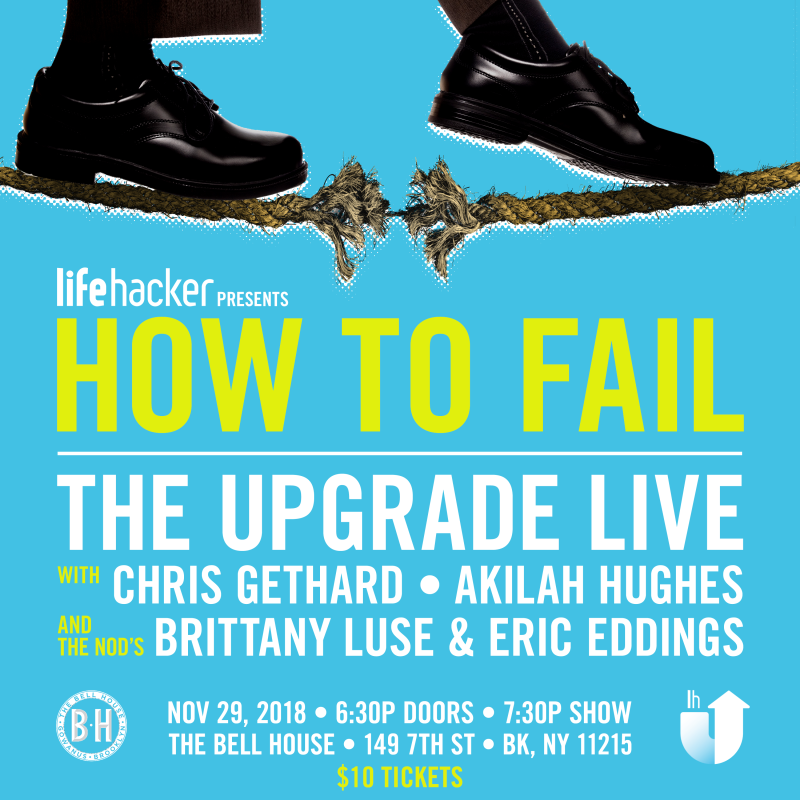 More about The Upgrade: Each week, Melissa Kirsch & Alice Bradley of Lifehacker bring in all-star guests to tackle the stuff that matters—like how to be happy, how to buy a TV, how to be less bad with money and how to tell if you’re dating a psychopath. Look, you’re doing great, but quite frankly we think you can be a little better. All your friends do too. It’s time for The Upgrade. Chris Gethard: Chris Gethard is the star of “The Chris Gethard Show” and the host of the popular Earwolf podcast “Beautiful Stories from Anonymous People.” Chris starred in the Mike Birbiglia film, “Don’t Think Twice,” and can be seen as ‘Todd’ on Comedy Central’s “Broad City.” Other credits include “Inside Amy Schumer,” “Parks and Recreation,” “The Office,” and the film “The Heat.” Chris is also the author of the book A Bad Idea I’m About to Do and his first stand-up album (“My Comedy Album”) debuted at #2 on Billboard’s Heatseekers chart in 2014. Chris’s one man show, “Career Suicide” (produced by Judd Apatow), premiered on HBO in 2017 after completing a successful off-broadway run at The Lynn Redgrave Theatre in NYC. Chris’s next book, Lose Well (HarperOne), is due out on October 16, 2018. Akilah Hughes: Akilah Hughes is a writer, stand-up comedian and YouTuber residing in Brooklyn. Her work has been viewed millions of times on Refinery29, Huffpo, HelloGiggles, Elite Daily, Femsplain, MTV, Yahoo! and on her personal YouTube channel, It’s Akilah, Obviously! She’s currently a digital correspondent for Fusion’s Pop and Culture team and a 2015 Sundance fellow. In the fall of 2016, Razorbill, an imprint of Penguin Random House, is publishing a collection of her personal essays. The Nod’s Brittany Luse and Eric Eddings: “The Nod” tells the stories of Black life that don’t get told anywhere else. Our show ranges from an explanation of purple drink’s association with Black culture to the story of an interracial drag troupe that traveled the nation in the 1940s. We celebrate the genius, the innovation, and the resilience that is so particular to being Black — in America, and around the world. Click here to learn how to pitch us story ideas! Brittany is a producer and host at Gimlet. In her spare time, she co-hosts “For Colored Nerds,” an independent podcast about race, news and pop culture. She hails from Farmington Hills, Michigan and is a very proud graduate of Howard University. Eric co-hosts The Nod at Gimlet. He also co-hosted “For Colored Nerds,” an independent podcast about race, news and pop culture with @bmluse. Prior to working at Gimlet, he helped nonprofits and foundations develop digital strategies at Fenton.